A birthday is an important occasion that is worthy of a big celebration, and a spectacular birthday card with fireworks bursting in the sky would certainly be the type of birthday card to send! This sparkling and golden colored birthday card will let your fabulous sister know that her special day is a very important one. Send this great birthday card out to her right away so she can start her day with some excitement! Happy Birthday To My Fabulous Sister! If you are looking for a birthday card that is bright and sparkling, then this is it! Your sister is going to love this happy birthday card! It features colorful sparkling lights and fireworks that represent a celebration. The words placed on top of the bright pink background will let your sister know that you think she is fantastic. It will make her birthday even more special! 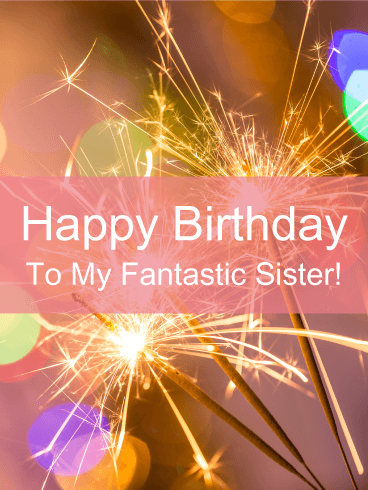 Send your sister this exciting happy birthday card for her special day! It's bursting with color and features sparkling balloons and confetti. It also displays birthday candles sitting atop a birthday cake with frosting and sprinkles! It will surely get her excited about her birthday. 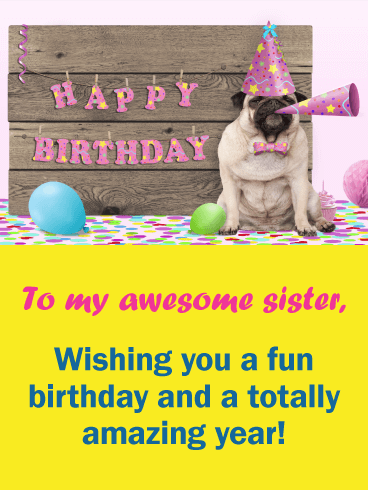 So send this terrific birthday card out to wish your sister a happy birthday and let her know she is the best sister ever! 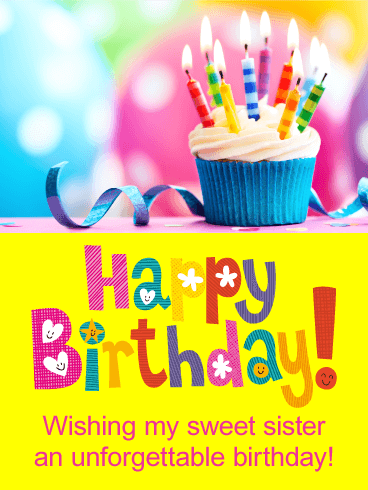 This cute and colorful birthday card would be perfect for your sister's birthday! It features a delicious cupcake with pretty lit candles and birthday balloons in the background! The fun happy birthday lettering adds an element of celebration and creativity to this birthday card. 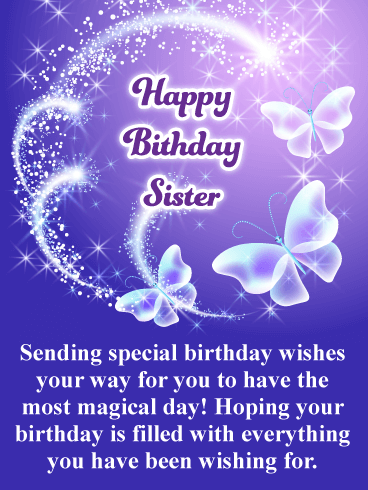 So wish your sister an unforgettable birthday with this festive birthday card, it will make her birthday a special one! 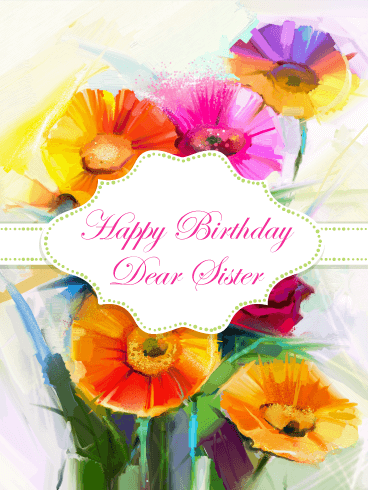 Wish your sister a happy birthday with this colorful and festive birthday card! The message, "Happy Birthday Sis" is front and center and has a very creative look! The little birthday hats in the background add to the celebration and make this birthday card even more awesome! 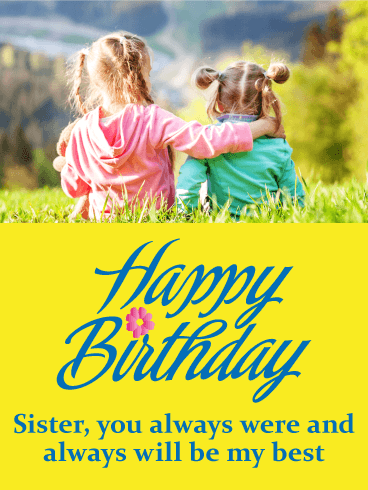 Send this great birthday card to your sister today, she will appreciate that you found such a special birthday card just for her! 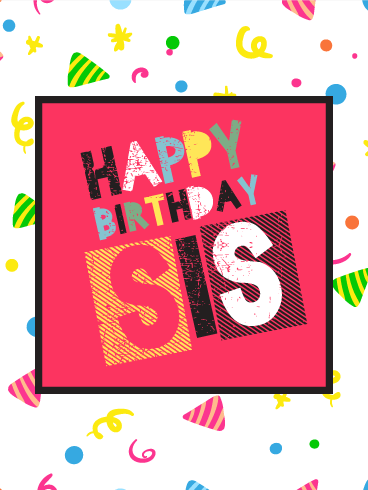 It's your sister's birthday and that means it's time to party and have some fun! Her birthday is only once a year, so remind her that it's time to celebrate! This birthday card features a festive image that displays a group of people wearing birthday hats and holding drinks, and they are ready to start the party! 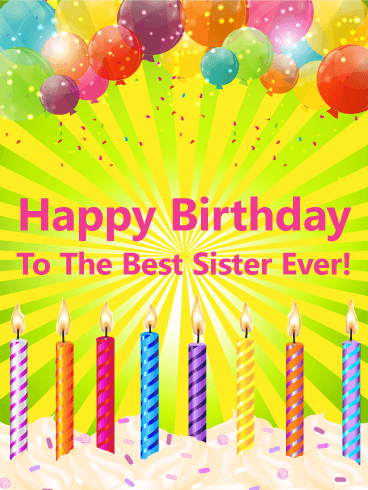 All they need is your sister to officially start, so send this birthday card out to her right away! 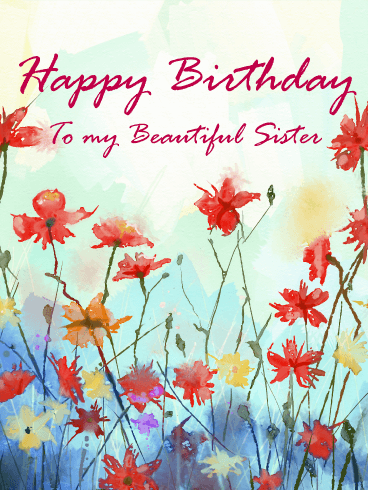 Send a meaningful birthday card to your sister this year for her special day. This touching birthday card lets your sister know that she was your best friend when you were kids and she still is. The birthday card features a beautiful image of two sisters in a field, as well as lovely happy birthday lettering. 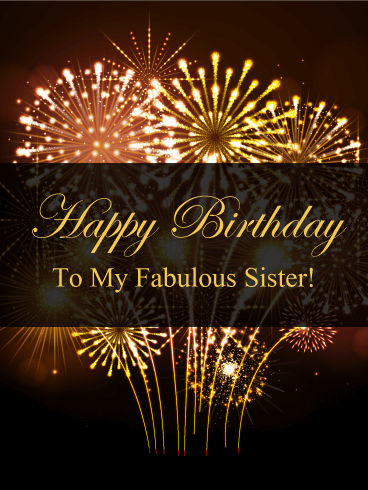 Send this wonderful birthday card off to your sister to make sure she has a great day! Make sure to send your sweet sister this decorative yummy cake for her birthday! It will certainly brighten her day! It displays a fancy cake with many colors and lit candles, as well as a pretty pink background. 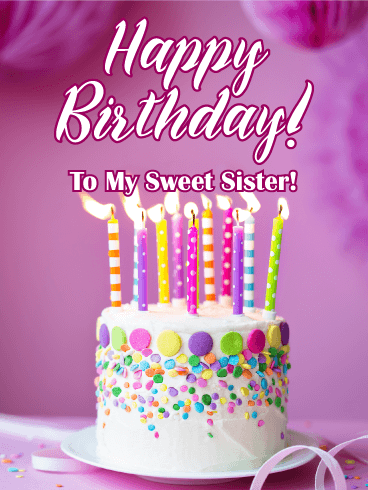 Sending this birthday card will let your sister know that you care about her enough to send the very best on her special day, and she will certainly appreciate it! 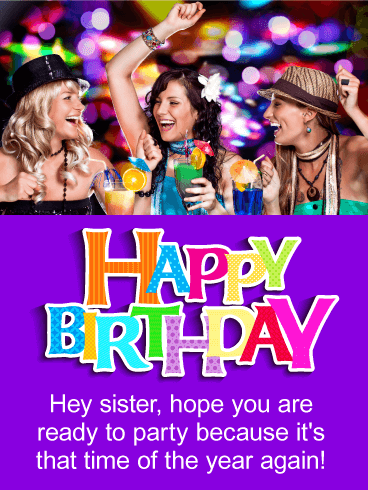 If you want to send a colorful fun birthday card to your sister this year, we have the perfect solution! 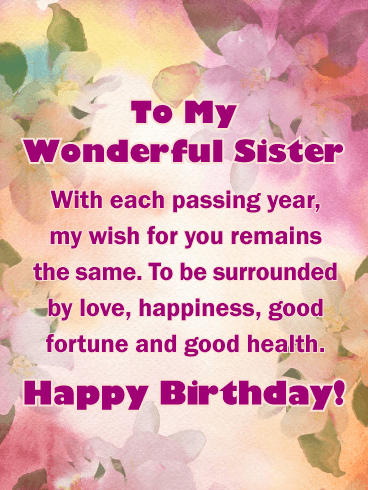 This great birthday card will wish your awesome sister a happy birthday and a totally amazing year. It features a cute dog wearing a birthday hat surrounded by confetti and balloons. He is ready to go and meet your sister to wish her the birthday she deserves!